PRODUCT DESCRIPTION: Steel case which has a lid that opens up to a chamber that houses two full size Rat Traps. 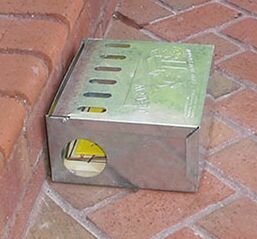 This case is designed to both protect the traps and to keep unwanted people or pets from accidentally getting hurt by traps which are set out for rat control. They can be permanently secured for added security and protection and will comfortably allow rats to enter, get trapped and be contained so that you don't have any mess to clean. These cases can also be hidden behind boxes, used outside along rodent pathways and just about any where the use of a trap out in the open would not work. In fact, by having two traps installed in the station, you have the possibility of trapping two rats at one time. This is a great device to use when you know of a rodent trail but cannot openly set traps. These stations will enable you to conceal your trap and still make an effective set. By having the traps in the station, they won't be set off by rain or other environmental factors so you will get better and faster results. We sell the cover separately or with traps. 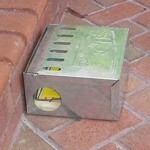 WHERE TO USE IT: In the home, garage, outside or anywhere you want to use Rat Traps. RATE OF APPLICATION: Two traps per Station and place stations no greater then 20 feet apart along known rodent trails or areas where you see droppings, rubs or where they are feeding.